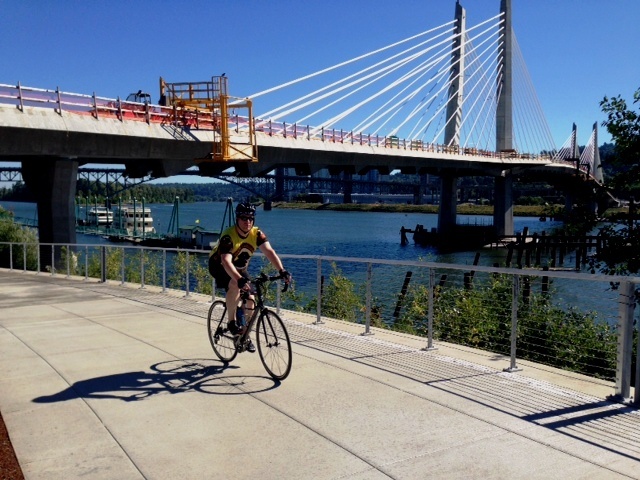 A cyclist enjoys the new Eastside Greenway Trail on June 30, 2014 during the first hours of the unofficial re-opening. 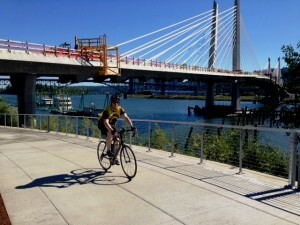 The Eastside Greenway Trail along the Willamette River has re-opened between southeast Caruthers Street and OMSI. The multi-use path had been closed for 14 months during the initial construction phase of the Tilikum Crossing that was built over the trail. The re-opening of the greenway also allows bicyclists and pedestrians to travel under Tilikum Crossing, providing you the closest view yet of the new transit bridge. The re-opening of the Eastside Greenway Trail gives the public its first look at the underbelly of Tilikum Crossing. The bike/pedestrian improvements to nearby southeast Water Avenue made as part of the Portland-Milwaukie Light Rail Transit Project will remain in place. This gives bicyclists two designated options to travel through the area and make connections with the Springwater Corridor Trail. This fall, as part of the project, more bike and pedestrian improvements will be put in between the river and southeast Powell Boulevard. Tilikum Crossing is the first multi-modal bridge in the U.S. to carry light rail and streetcar trains, buses, bikes and pedestrians, but no private vehicles. When the bridge and the entire Portland-Milwaukie Light Rail Transit Project opens on Sept. 12, 2015, it will improve transit service in this corridor, as well as expand bike and pedestrian facilities. Tilikum Crossing is the first bridge built over the Willamette River in Portland in more than 40 years, and will be the first cable-stayed bridge for the region, extending 1,720 feet (.326 miles) over the river. 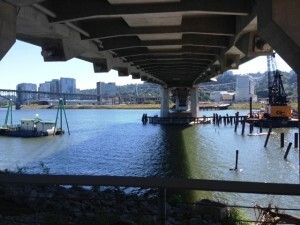 The bridge includes two 14-foot-wide multi-use paths—one on the north side and one on the south—the widest multi-use paths on any bridge in Portland.